After a few seconds of silence, the issue that has simmered for years is finally brought up. It’s the 24th anniversary of the 1963 European Cup final and, in order to commemorate the occasion, the Italian state broadcaster RAI have gathered Cesare Maldini, Mario Coluna and renowned journalist Gianni Mina into a studio to watch and discuss Milan’s 2-1 win over Benfica at Wembley. The panel have just seen the pivotal moment in the 59th minute, when Gino Pivatelli fouled Coluna to put him out of the game. The incident didn’t just reduce Benfica to 10 men in the absence of substitutions; it removed their most influential player. In a period of perceived attacking innocence, Coluna was the architect who gave the defending European champions clear direction and design. Now, the question is how much direction and design lay behind the foul. So, Mina eventually broaches it. An agitated Coluna cuts him off, pointing at the screen as a translator relays his words. “Coluna said it decided the game,” Mina interjects. The game itself, meanwhile, did more than decide that season’s European Cup. It was one of those exceedingly rare individual fixtures that distinctly divided eras in the competition’s history; a meeting of two ultimately dominant teams at opposite points of their cycle. Because of the improbability of so many elements aligning – right down to the luck of the draw – there have only really been three such clutch contests in 58 years of the competition. In the 1972-73 quarter-final, a fully-formed Ajax brutally illustrated to Bayern Munich just who the continent’s best team were. Many of the German players cited that resounding 4-0 defeat as the most traumatic match of their careers, but also the final lesson that transformed them from domestic champions into European champions. After that elimination, Bayern immediately embarked on their own three-in-a-row. Four years before that, Milan had much the same effect on a more callow Ajax by beating them 4-1 in the 1969 showpiece. 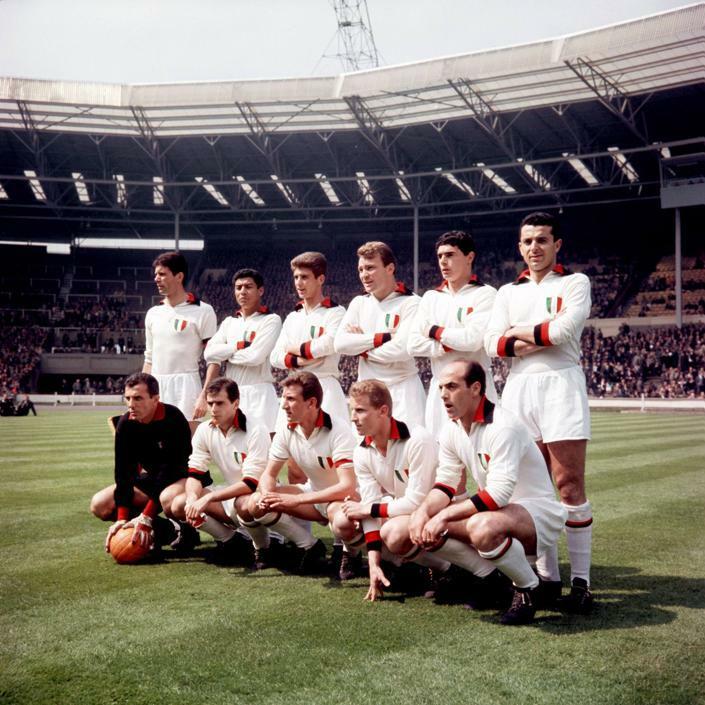 In 1963, though, it was a nascent Milan that showed much greater savvy than reigning champions Benfica. That wasn’t the only aspect that so marked this match apart. It was also unique in the manner that one moment so distilled all of the defining traits of those eras either side, effectively bringing two decades down to a single kick. In that, Pivatelli’s foul was as layered as it was lasting. Because, even if an injury was not intentional, it was the ultimate possible consequence of Milan’s distinctive approach. Manager Nereo Rocco had specifically detailed Pivatelli – a notional wing-forward – to shackle the playmaker. Moreover, he had dropped the prolific Paolo Barison in order to do so. Never before at such a vaunted level had a team so conspicuously compromised their existing attacking approach. It perfectly illustrated Rocco’s new pragmatism. After eight years of free-scoring European Cups in which creators like Coluna had so much space to innovate, a more calculating breed of team and coach were now seeking to shut them down. Innocent attacking had started to give way to a singeing cynicism. The Pivatelli foul did not just symbolise a new era; it set the template for it. Wembley was witnessing the rise of Catenaccio. First, Rocco had to figure how to bring about the fall of Benfica. As the 1963 European Cup final kicked off, it was difficult to see where or how a sea change to more constrained football was coming. Milan began in assertively direct fashion, immediately taking the game to Benfica. Within seconds, Jose Altafini had latched onto a loose ball and charged straight at goal. Within minutes, the refined Gianni Rivera had attempted a perceptive through ball that fell just short. The Italian fans in the Wembley crowd even booed when Benfica had no option but to pass the ball back to goalkeeper Costa Pereira. This was not Catenaccio as it came to be recognised. For their part, the Milan squad themselves always bristled at their association with the philosophy. Cesare Maldini especially despised it, and frequently pointed to the team’s fine scoring record. The statistics certainly make a statement. In winning Serie A in 1961-62, they hit 83 goals in 34 games, 22 more than the next most prolific attack. In reaching that 1963 European Cup final, then, they hit 31 in eight – the highest ratio in the competition’s history. Even if 14 of those goals were against Union Luxembourg in the preliminary round, eight went past Galatasaray in the quarter-finals and five past Bob Shankly’s Dundee in the semis. The great misconception about Catenaccio, however, is that it was a fundamentally negative approach. It was not; it was an inherently pragmatic one. That was always Rocco’s great skill and, for all the players may have despised their association with the philosophy, there could be no denying their manager’s career was intertwined with it. Rocco was the coach that made Catenaccio mainstream in Italian football, and he would now do the same on the continent. Adapting the system from Gipo Viani at Salernitana in the 1940s, he added a more clinical form of counter-attacking and then applied it to unprecedented effect at both Triestina and Padova. As those provincial sides powered up the table, famed football journalist Gianni Brera notoriously described Catenaccio as “the right of the weak”: finding some cleverer strategy to trump superior opposition. This was the crux of that 1963 final. For all the apparent bravery that Milan showed in the opening minutes, an anecdote from the build-up betrays their true mood. “We were pulling into the Wembley car park when Rocco noticed the fear in our faces,” Maldini has said. So often severe and authoritarian with his players, the coach knew to this time use humour. That might have helped Milan as they built up to kick-off but Rocco knew it would not be enough over the course of the entire game. Ultimately, his squad were intimidated by Benfica because they were inferior. The Portuguese side had proven their lasting their quality not only by lifting the European Cup in successive years, but by proactively going toe to toe with the competition’s benchmark sides. There was no luck of the draw. Benfica admirably went for the win. In the 1962 final, they beat Real Madrid 5-3. A year later, they defeated the only other side to eliminate Real in Europe, Barcelona. Moreover, the team were at the forefront of football’s dominant attacking philosophy at that point. Previous manager Bela Guttmann had been at Sao Paolo in 1957, directly influencing the Brazilian side that would win the 1958 World Cup in such vibrant fashion. With Guttmann taking that approach on further at Benfica, it could even be argued that they represented the culmination of that era of attacking football in continental club football. The 1962 final against Real Madrid certainly represented it, finishing 5-3 and bringing together all that had been great about the first seven years of the competition: its two best teams and only champions; glorious attacking football and great players fully applying their talent. Although Guttmann departed in controversial fashion immediately after that victory, to be replaced by Chilean Fernando Riera, Eusebio would later argue the team was so intensely integrated by that point that any manager was irrelevant. Rocco would have to prove otherwise. Realising that it would only tempt defeat to take on Benfica on equal footing, the Milan coach tipped the balance. He invoked “the right of the weak”. Although Paolo Barison had scored six goals from the right flank en route to the final – with three of them genuinely important strikes – he was dropped for the more functional Pivatelli. The squad were surprised, primarily because the 30-year-old’s career as a forward had faded and he was now only intermittently used as a defensive option. Now, he would have the most important defensive job of all: to track back and stop Coluna at left-half. The scale of the challenge was emphasised by how quickly the playmaker seized a hold of the game. Although Benfica were initially hemmed by Milan’s abrasive attitude, it was an 11th-minute drive and long shot from Coluna that characteristically brought them back into the match. For the first time, Milan were pinned back and suddenly forced to re-assess how open they’d been. Within seven minutes, those pre-game fears had been borne out. Shortly after the effervescent Antonio Simoes had started to unravel the Milan defence with an intricate run, the rest of the Benfica attack prised them apart. Collecting a loose ball in his own half, Coluna immediately flicked the ball forward to Jose Antonio Torres. The six-foot-three forward controlled the pass at mid-height before poking it on for Eusebio in one movement. From there, about 35 yards from goal, the forward displayed his devastating acceleration to tear away from two Milan defenders. Every stride only opened up more space, until Eusebio was left to angle the ball in off the inside off the post. The entire move was the perfect combination of poise, power and precision, taking just nine seconds to go from Coluna’s right boot to the back of the net. And, for the next 10 minutes or so, Benfica were buoyant, bouncing the ball around the pitch with joyful ease. One swift interchange reflected the attacking integration that Guttmann had worked so hard to develop. Much like for the opening goal, Milan were struggling to keep up and in danger of being swept away. It was around that point the game saw its first key change, but not from Rocco. Although the 3pm Wednesday kick-off time had brought the Wembley crowd down to just 45,700, the noise made it impossible for the Milan players to hear any instructions from the bench. So, they took matters into their own hands. In truth, it wasn’t entirely without authorisation. As domineering as Rocco so often came across, he placed great trust in his senior players. A group consisting of Rivera, Maldini and Giovanni Trapattoni formed the coach’s ‘internal commission’, who he would regularly consult before games. It was also telling how many of Rocco’s players, in contrast to Helenio Herrera’s, succeeded in management. At a fraught stage of the 1963 final, they would illustrate why. Maldini told Trapattoni to take over the job of marking Eusebio from the ailing Victor Benitez. In the previous season’s final, the then 20-year-old forward had signalled his ascension as European football’s dominant star by besting both Ferenc Puskas and Alfredo Di Stefano to score the double that won the trophy. Di Stefano handing Eusebio his shirt after the game was seen as a symbolic passing of the torch. A year on, there seemed no one either on the continent or that final to match him in terms of box-office quality or basic talent. Trapattoni, at the least, began to match his every movement. Conspicuously, after 29 minutes, Eusebio was left limping and requiring treatment. It marked another shift. Rivera also made his mark on Coluna, stealing the ball before nutmegging a defender. Milan began what was probably their best period of the game, pummelling Pereira’s goal and forcing him into all manner of flaps… but with no end product. At that stage, Altafini was enduring a miserable afternoon. On 35 minutes, defender Mario David hooked a hugely inviting ball across the face of goal, which seemed to only require a touch. Instead, Altafini completely missed it, compounding the error with the awkward manner in which tried to lift his right leg to finish it. It was not the movement of a confident forward. Altafini could immediately be seen holding his hands up to winger Bruno Mora. Although the forward would go onto become the fourth highest scorer in Serie A history, his reputation was rarely beyond reproach. On first taking over at Milan in 1961, Rocco publicly railed against Altafini more than any player other than Jimmy Greaves. The coach felt the duo were disconnected from the rest of his developing system, and unwilling to work for it. To a degree, the dilemma further displayed the manager’s fundamental approach to the game. Bestowed with two of the game’s greatest ever goalscorers, he sought to force them into a system rather than facilitate their main ability. It failed to function, with Milan dropping to seventh in the table by November of the 1961-62 season. To his credit, Rocco eventually found a solution. As fed up with the unhappy Greaves’ indiscipline off the pitch as well as on it, the coach replaced the English forward with Brazilian passer Dino Sani. Altafini was spared. In theory, the move represented another regressive step, given how it involved the use of another midfielder at the expense of a forward. In practice, it immediately gave Milan balance and unlocked their attack. From Sani’s debut against Juventus, Milan took 31 points from the next 34 available to win the title. There was suddenly a clear line from Sani through Rivera to Altafini. In that match against Juve, the forward scored four goals in a 5-1 win. By the 50th minute of the 1963 final, though, Altafini had already squandered four glorious chances. On the stroke of half-time, he followed the miss from the David cross by heading straight at Pereira from just yards out. Two minutes after the break, he drove wildly across goal. Moments later, he somehow put the ball over from just under the bar. It was because of occasional wastefulness like that Brera nicknamed Altafini ‘Conileone’: he supposedly combined the weakness of a rabbit, coniglio, with the fierceness of a lion – leone. This match at Wembley would sum up that contradiction, even if it would also finally banish the accusation that he never produced in big games. Because, out of nothing, Altafini equalised. Or, at least, out of a bad Benfica miss of their own. On 57 minutes, Eusebio picked the ball up in his own half and started to power through Milan in much the same manner he did in the 1962 final against Real Madrid. Instead of cutting inside as in that game, though, he was forced to pass wide. The ball was floated across the box, only for Torres to head it back the same way with the goal at his mercy. Reprieved, Milan eventually work the ball up the right through David. He lofts it inside for Rivera, who attempts to power it at goal. The shot is blocked but takes a lucky bounce for Altafini to opportunistically fire it into the corner. Milan were deservedly level. As intermittently poor as Benfica had been by their standards, the goal couldn’t have been described as a true turning point. It wasn’t something the Portuguese were unaccustomed to, given how they normally intended on just outscoring opposition. The approach had worked in the previous two finals. In 1962 in Amsterdam, they had suffered the supposedly psychological blow of Puskas putting Real Madrid straight back into the lead after Benfica had pulled back a 2-0 deficit, only to still win 5-3. In 1961 in Berne, they recovered from an early Sandor Kocsis header to defeat a brilliant Barcelona 3-2. It was well inside his own half, about a minute after Altafini’s equaliser, that Coluna proactively intercepted a Pivatelli pass and strode forward. As the Benfica number-six raced away to power through one of the gaps that were so prevalent in European football of the late 1950s and early 1960s, Pivatelli immediately sought to close it – just as he’d been trying all afternoon. At the moment the Milan player reached, though, Coluna evasively and intelligently poked the ball away. In full flight, he was about to force a propitious three-on-two. Until, Pivatelli reduced it all to one kick. The Italian lifted his leg and sent Coluna crashing to the ground. The action of the trip itself seemed minimal, almost innocuous. The consequences were both instant and immense. Most conspicuously, it took Coluna a few moments to get up before he had to be helped off the pitch with a broken foot. The injury didn’t appear to immediately affect Benfica. They remained on top for the next few minutes, with Simoes seeing a lot of the ball down the left. For all their charges, though, there were no actual chances; no one to suddenly open up all that increasingly enclosed space around the Milan box. The offset, of course, was vast tracts at the other end of the pitch. On 65 minutes, Milan gave Benfica something of a warning about them, as Altafini flicked Mora through to bring a save from Pereira. That warning was not heeded. With the Portuguese side pushing forward moments later, Rivera stole the ball in the centre-circle, deftly set himself up and threaded a fine through ball for Altafini. One on one with Pereira, the Brazilian – perhaps inevitably – saw his first effort saved. There was nothing to stop him finishing the follow-up. Milan, for the first time, were ahead. Coluna has remained indignant about the entire incident ever since, at least right up to an interview with Ben Lyttleton in 2004. “I ran past him but he chased me, fouled me from behind and broke my foot,” he said. Perhaps more interestingly, the playmaker thought Trapattoni was responsible. “I never spoke to Trapattoni again, not even when he was managing Benfica in 2004-05. Nothing. I don’t want to talk to him again. He meant to do that. After the game [in 1987], an Italian TV station invited me to go to Milan to meet him live on a TV show. While Trapattoni evidently got unfair blame for that foul, he deserves a lot of credit for the effectiveness of Milan’s defending thereafter. At one crucial juncture, the left-half put in a cast-iron – but entirely clean – challenge on Joaquim Santana that completely ended a Benfica attack in the Italian box and allowed his side to keep the ball. It wasn’t far off the perfect tackle. Riera didn’t see all of Milan’s efforts that way. After the final, he was reportedly shocked at the “ungentlemanly” approach of Rocco’s side. That was somewhat surprising given that the Benfica coach had been in charge of the Chilean team involved in the notorious Battle of Santiago against Italy during the 1962 World Cup, with many of his players keenly trading blows. Either way, the last 20 minutes of the Wembley final fell into a pattern that was to become all too familiar over the next decade and beyond: an Italian team resolutely defending; an opposition side in charge of the ball but vainly chasing the game. Coluna would hobble on again about 10 minutes from the end, but to predictably no effect. In Benfica’s two previous finals, the relentless willingness to attack created an element of doubt about the outcome right until the end. Here, there was no grand rally, no rousing late chance. Milan had resolutely closed out the most open era in European football. With one kick, the entire climate had seemingly changed. Rocco’s club were European champions for the first time, also shifting the continent’s centre of power from Iberia to the burgeoning city of Milan. The trophy would spend four of seven seasons in the Giuseppe Meazza stadium. Because, across the famous arena, Angelo Moratti was already looking on enviously at all Rocco had achieved. The Internazionale president was so fed up of failure that in 1961 he went and paid a record £35,000 for the best manager in the business, Helenio Herrera. It was part of a period of Italian football driven by what the English press called ‘the lure of the lira’. The excess off the pitch, however, was contrasted by the economy on it. Although Herrera’s Barcelona had been one of the highest scoring sides amid even the abandon of the late 1950s, he gradually realised the tactical canniness of Serie A required a much greater degree of calculation. Catenaccio was now too widespread. In October of the 1962-63 season, after a defeat at Atalanta to yet another inferior side successfully practicing Rocco’s style of pragmatism, the Argentine made his Faustian decision. Inter would convert to Catenaccio. Characteristically, Herrera did not just adapt the philosophy. He took it to extremes. Inter immediately produced what was statistically the meanest defence that Serie A had ever seen to win the title, and then a series of the lowest-scoring ties the European Cup had yet experienced. The 1965 final was a nadir, as Herrera’s side beat Benfica 1-0 with a performance of astounding austerity. Away from the pitch, though, there was an even grimmer aspect to their glory. Evidence soon arose of Inter using their riches to fix European semi-finals, while Herrera was accused of doping players. Unlike Pivatelli’s own evasion of the rules in that 1963 final, there could be no disputing the intentions there. There could also be no denying that Catenaccio had started to condition the sport as a whole, even if most teams were never going to go as far as Inter. That 1963 final marked the mid-point of a period in which the then frenzied sport cooled to a recognisable version of its current form. The World Cups either side provide a telling barometer. In 1958, the average goals per game had been a thrilling 3.6. By 1966, it was a more moderate and modern 2.6. More than anything, Pivatelli’s foul brought all this to the fore. While aggressively targeting opposition players was nothing new, it had never quite been as systemised as this. There was deeper method to any malice. The 1963 final did not just lose Coluna. Football lost some of its innocence.